Text-To-Speech Technology: READS your recipes to you while you cook! Over 2 Million recipes - or add your own! Featuring text-to-speech technology, the tablet reads recipes out loud as you cook along. Now you can prepare entire meals without stopping to find your place or turn a page. Don't worry about counter spills and sink splashes with your Key Ingredient Recipe Tablet. The heat resistant silicon case easily wipes clean and adds a layer of protection for bumps and falls. A messy kitchen is a happy kitchen! 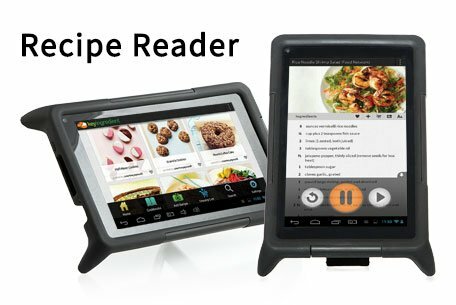 The tablet features a preloaded cookbook with two hundred recipes to choose from. When connected to Wi-Fi, the tablet gives you access to over two million recipes. You are also able to add your own - from the family archives, your favorite cookbook or your latest online discovery. The Key Ingredient Tablet uses an Android operating system and is Wi-Fi enabled. Use your tablet to play music and video, run games and apps, or browse the web (for more recipes!). This tablet means you'll never need to borrow a hand in the kitchen again. Browse & Search: Easily search or browse over 2,000,000 recipes streamed from keyingredient.com - a free social recipe website with over two million recipes shared by our members. RecipeSnapTM: Keep precious recipes safe and free up your counter space with a paper-free kitchen. Collect & Organize: Collect recipes quickly with the Favorites icon and organize your collection easily with cookbooks. Sync & Share your entire collection and Grocery List through your free KeyIngredient.com account automatically.